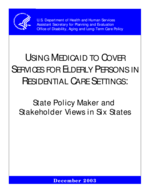 The Department of Human Services (DHS) contracts directly with qualified providers on an open enrollment basis. Any provider agency that meets the enrollment or licensing criteria for the service it proposes to provide under the waiver is eligible to apply for a contract with DHS. Providers are required to maintain current certifications or licenses for the applicable services throughout the time period during which waiver services are delivered. RNs contracted with DHS and nurses employed by or contracted with licensed home and community support services agencies. Home and community support services agencies. In addition to meeting all relevant licensing and regulatory requirements, providers must agree to contractual rules for accepting CBA waiver clients. The Medicaid contract rules specify three different types of housing options in which waiver clients may be served: assisted living apartments, residential care apartments, and residential care non-apartments. All are considered types of assisted living and all are licensed as assisted living facilities. The three types of housing options are described below. An assisted living apartment--which may be an efficiency or a one-bedroom--is defined as an apartment for single occupancy that is a private space with individual living and sleeping areas, a kitchen, bathroom, and adequate storage space. The bedroom must be single occupancy except when double occupancy is requested by the participant. The apartment must have a minimum of 220 square feet, not including the bathroom. Apartments in pre-existing structures being remodeled must have a minimum of 160 square feet, not including the bathroom. The bathroom must be a separate room in the individual's living area with a toilet, sink, and an accessible bath. The kitchen is an area equipped with a sink, refrigerator, a cooking appliance that can be removed or disconnected, adequate space for food preparation, and storage space for utensils and supplies. A cooking appliance may be a stove or microwave. Residential care apartments are units with two bedrooms, each with a single occupant, with a shared kitchen and bathroom providing a minimum of 350 square feet per client. Indoor common space used by residents, such as the dining room and entertainment room, may be counted in the square footage requirement by averaging the total square footage of the common areas and dividing by the number of beds in the facility. Kitchens must be equipped with a sink, refrigerator, cooking appliance (stove, microwave, built-in surface unit) that can be removed or disconnected, and space for food preparation. A residential care non-apartment setting has living units that do not meet either the definition of an Assisted Living apartment or a Residential Care apartment. These units may be single or double occupancy units and must be in free standing buildings that are licensed for 16 or fewer beds. These non-apartments tend to be the older personal care facilities (redefined as assisted living facilities in 1999). Most have dual occupancy rooms and some have rooms with up to four residents in a dormitory style. No more than 50 percent of the beds in a given facility can be shared by three or more persons. Bathrooms are required for every six residents.